Transform your garden into a retreat using the Eden Westhaven Arbor. When placed at the entry to your yard, this striking structure easily forms a haven for you and your guests. The flat top of this unit brings clean lines and angles to the item, furthered by its square lattice side panels. A slight curve at the top of each lattice panel, combined with the overhanging vertical rails, capture attention and bring contrast to the unit. Additional trim caps on each leg complete the effect, and the white color adds a timeless feel. For more drama, plant vines or climbing flowers around each side of this arbor, and weave their tendrils in and out of the grid as they grow. The leaves and blooms will easily contrast the structure, and the vinyl construction offers years of service. This unit will not rot, yellow, or warp, for a perfect garden addition. Place the included anchors into the arbor's legs to secure it into the soil. 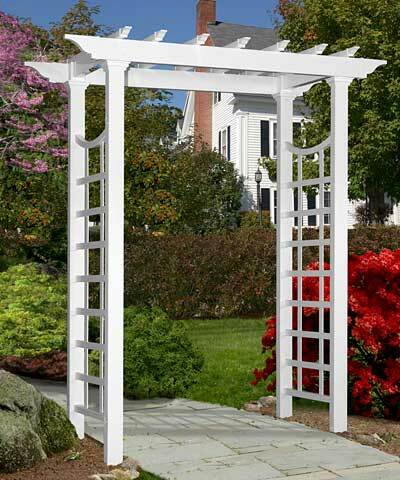 Add a bold look to your outdoor sanctuary using this Westhaven Arbor. Assembly required. Twenty year warranty.